Looking back at ‘Dawn of the Dead’ 15 Years Later! Zombies are a part of pop culture and a staple of a truly great horror story. From books, television, video games, movies and even the stories told from African and Haitian tales, zombies have been around for quite some time. It’s the movie world where zombies made us fear the night, be cautious at dawn, and prepare for battle during the day and that credit goes to George A. Romero – The Godfather of the Dead. His iconic horror trilogy set the standard for the zombie genre and the sleuth of the remakes, re-imaginings and other such tales of when the dead walk the earth. Speaking of remakes, Dawn of the Dead was remade in 2004 by a new director named Zack Snyder (popular for the recent DC Films) and his vision brought forth a new idea to the zombie world. It gave us action, gruesome violence and everything that Romero’s vision was and wasn’t. It was different. So, after fifteen years, why is Dawn of the Dead still highly regarded? Why was it a success? How does it compare to other films in its genre? And, is it a remake or a re-imagining? Dawn of the Dead was Zack Snyder’s debut film and at its time, was the highest grossing zombie film ever made! An impressive feat no doubt. It told the story of a mysterious virus that turned people into ravenous and bloodthirsty killing machines- known in pop culture as “zombies”. A group of survivors in Milwaukee find themselves locked inside a mall safe from the threat of the monsters lurking outside. In an attempt to survive, they stage a last stand battle with the undead. With Romero’s films, the undead are slow moving, stronger in packs and generally more a nuisance than a major fatal problem. This time around the undead are fast, ferocious and act more like a rabid dog mixed with the Black Friday crowds who storm the stores hungry for a deal. They are still killed in the same manor- shooting them in the head. In comparing to the original ’78 version (which we’ll cover in short time), this movie is nothing like it at all. Romero’s version had hidden themes, jokes about capitalism and marketing, and wasn’t necessarily about humans vs. the undead. In Snyder’s version, the idea is clear, it’s us against them. Sure, we do always ask ourselves who is really the more dangerous; the undead or the people we are keeping company with? But overall, Dawn of the Dead is an action-packed blood-soaked thrill ride that is as intense as the zombies are in the film. From casting to impressive makeup and the cinematography which paints this movie as a grim hell that we are entering, Dawn of the Dead is an impressive film. As a fan of Romero’s work, any person familiar with his films will notice the numerous references in this version when compared to his vision. From the gas station blowing up in the beginning, to the Gaylen Ross store, Ving Rhames’ character being a clear reference after one of the characters from the original film, and not to forget the three-cameo appearance of Ken Foree, Tom Savini and Scott Reiniger, all of whom starred in the 1978 horror classic. The only substantial difference is that this movie is a real suspenseful nail-biter shot through with white-knuckle tension. Over the years, the zombie genre has slowed down a bit. We don’t see much of them anymore. Sure, we have the big titles such as 28 Days Later, Shaun of the Dead, Zombieland and of course, the highest grossing film: World War Z. We also have The Walking Dead on television which is quite popular as well, but zombies aren’t that big or impressive anymore. Zack Snyder changed the idea of fast-paced zombies and also omitted a good amount of screen time for the cast in favor of frenetic action sequences. The character development is very small in the movie, but it’s just enough for us to remember them, perhaps not made to be iconic characters, but we know who they are and ultimately what will happen to them. For me, I had no issue with this. Thinking back, I saw this remake prior to the original. I was only a preteen when I walked into the theater and experienced this film and was utterly blown away. I was impressed mostly by the makeup and those fast zombies. To me it made sense, if the undead were aggressive and fast-moving, then the world’s population would quickly decline, leaving the undead to rule the land. If you pick up a copy of Dawn of the Dead, then I would recommend that you stick with the theatrical version. It’s better cut, flows smoothly and is probably one of the fastest one-hundred minutes that you’ll sit through. The Director’s Cut adds additional footage, but I felt that it slows the movie down a bit. Some scenes are a nice addition, but overall, the theatrical cut is the way to go. Fans were highly anticipating the arrival of this new version but the reaction was a bit mixed. Majority of fans missed the more detailed story, expanded character development and actually missed the slow-moving zombies. After all, that’s how we remember them best. Zack Snyder surprised everyone with this film and considering how popular the 1978 version was, it was no surprise that Dawn of the Dead grossed over $100 Million worldwide, it being the first film of its genre to do so. I think people were impressed with how fast the movie plays out. It has a simple plot, worthy villains, and a couple of surprises along the way. Among the aforementioned popular zombie films, Dawn of the Dead stands out for a couple of reasons. The movie doesn’t explain why the infection is happening, the zombies are regarded as the villains (in fact camera shots last less than two seconds of them) and the movie isn’t over-the-top as say as World War Z was. Of course, the characters make a decision that we may not agree with but the last twenty-five minutes of the film are truly amazing. The action is chaotic, brutal and memorable. I felt that Dawn of the Dead succeeds in what it was trying to accomplish as a fast-paced zombie film that delivers thrills and scares. Now the question that I’ve pondered over the years; is Dawn of the Dead a remake or a re-imagining? On the surface, it is a remake but the more you look at it, you begin to realize that it isn’t, after all. It doesn’t have the same themes present in the ’78 version and doesn’t have the same ideas at heart. 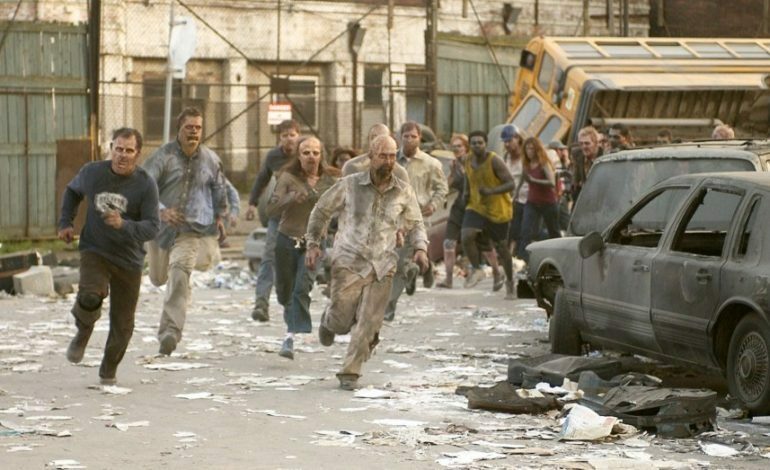 The setting is the same; a group of survivors take refuge in a mall and try to survive against a hungry horde of undead. The movie is violent, gory and offers a lot of fun that you’ll expect when watching a zombie film. The makeup effects were inspired by real-life emergency room patients, car accidents and other things that we don’t want to imagine happening to someone, and the zombies in this movie look spectacular (if that’s the right word to be said). Nevertheless, Dawn of the Dead is an impressive film that stands alone as a horror film. Even George A. Romero himself liked the film albeit it felt much like a video game than a movie. Still, with the ghost and apparitions taking the horror stage, it’s nice to go back and actually see a villain that can be stopped only if you have enough bullets to survive the onslaught. Dawn of the Dead is one of my favorite horror films of the twenty-first century and stands out as a strong choice for any avid zombie fan. Sure, Romero’s films are far better, but one can’t overlook the technical skill that Zack Snyder brought to the table with this film. There was a sequel announced shortly after which would’ve been titled Army of the Dead but was eventually canceled due to Snyder’s commitments to Watchmen. Netflix revived the project earlier this year and Snyder is attached to direct. While it won’t be a direct sequel to his debut film, I hope it has the same intensity as what he accomplished fifteen years ago. Whether you love horror or the undead, Dawn of the Dead offers a lot of fun, bloody violence and thrills galore. So, if you decide to watch it again, pay tribute to George Romero’s classic. So, ready up your shotgun, make sure you have enough kerosene tanks and be ready at Dawn because they are coming.